Rotonda Elk Lodge #2710 partnered with Vineland Elementary Afterschool program to provide sewing opportunities for children during November and December. Rotonda Elks and Rotonda Quilting Club members sat with each child as they sewed. The children in K-5th were given the opportunity to sew on a new sewing machine and complete hand-sewn Christmas projects. K-2nd graders made potholders and Christmas stocking ornaments. 3rd -5th graders made Christmas pillowcases and Christmas placemats. Close supervision, plastic needles and clothespins ensured a safe and fun environment. The children eagerly embraced the activity. Rotonda Elks Lodge #2710 purchased the sewing machines, fabric and sewing supplies funded by a Gratitude Grant from Grand Lodge in Chicago. 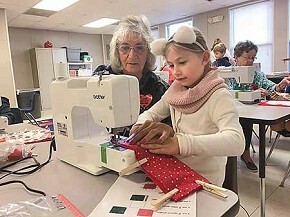 Rotonda Elks Lodge #2710 hopes to partner with area elementary schools next year to give young children the opportunity to learn life skills with the sewing projects. Pictured: Diana Heim (front) and Kathy Hudson (back) sewing with Vineland students.